Noah's Ark Was a Spaceship at The Slowdown, May 24, 2010. How big was the draw at last night’s MAHA showcase at Slowdown? Well, the parking lot was full, and for a big-stage show the room didn’t feel empty. My guestimate would be that 150 people were in the house at any given time. Not bad for a Monday night. I arrived too late to see the band that I would have voted for if I had voted — Dim Light played first at around 8 p.m. I caught most of Betsy Wells’ set. I’d never seen the band before, and hadn’t even heard of them before this show was announced (even though I’m told they’ve played at The Waiting Room before). They’re a young four-piece with two guitars who someone told me sounded like Arcade Fire, which, of course, they sound nothing like. Instead, Betsy Wells was a conglomeration of influences that no one in the band probably has heard of before. Two people in the crowd referenced The Feelies. One person told me they reminded her of Blitzen Trapper. Someone outside on the patio compared them to U2 and Neil Young (uh, no). I think if you listened to them long enough you’d hear whatever band you wanted to hear in their music. In other words, they sound like everyone — and no one. They’re a talented indie-pop band with a big-stage sound, but with songs that simply don’t stand out. Generic? Maybe. I think there’s something there, but it just ain’t “there” yet. Noah’s Ark Was a Spaceship added some stage spice in the form of a formal ball gown worn by lead guy Andrew Ancona Gustafson. Seems like everyone compares Noah to Sonic Youth, but to me, they sound like Seattle circa 1992 or one of the heavier, artier bands on Athens Ga. – Inside Out. Gustafson is a great lead singer who will take them far if he can tap into his undiscovered vocal range — and if they ever get “discovered.” They’ve got a new album coming out shortly (or so they said from stage). Last up was Flight Metaphor, but I didn’t stick around. 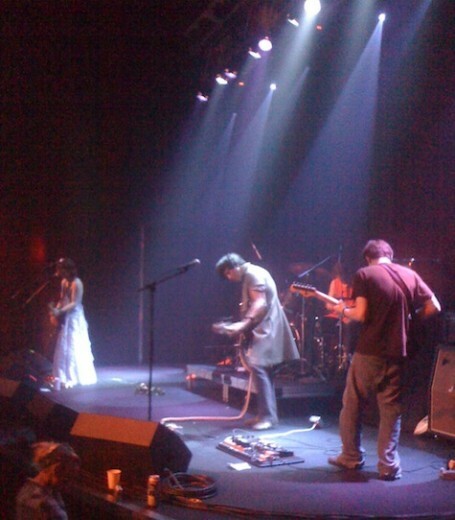 About an hour after the show ended, the MAHA organizers announced that Betsy Wells had won the ad hoc battle of the bands and would be invited to play the small stage at the MAHA Music Festival. Did the crowd — and conversely, the MAHA organizers — make the right choice? Find out for yourself July 24. Tonight at The Brothers Lounge it’s The Lepers CD release party with Bazooka Shootout and Kyle Harvey. $5, 9 p.m.